Mixed Martial Arts (MMA) has become very a popular and fast-growing sport these days. Due to a wide range of movements and flexibility in styles, MMA requires a different structure to it gloves. MMA gloves allow fighters to grasp and grip easily with open-fingered design and are less padded than boxing gloves. 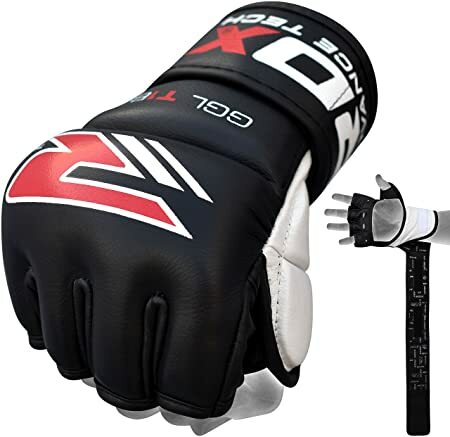 In this post, we will review some best MMA gloves available in the market. The Everlast Train Advanced MMA glove weighs seven ounces and they are 10.2×5.5×3.9 inches in dimension. The glove is perfect for mixed martial arts as they are ideal for heavy bag use or sparring since they allow clenching and striking. This Everlast MMA glove is made of premium synthetic leather which ensures its longevity. This material enhances the functionality as well as durability of the Everlast glove. The glove is constructed to offer maximum protection from the Dura foam padding that is used on the front and back of the glove. The closed cell Dura foam padding is soft, and thus protects the sparring partner from any injuries by strikes directed at him during the training sessions. The glove further protects the user due to the innovative feature of an anatomical thumb padding that doesn’t hinder the user’s mobility. This feature provides protection to the wearer incase the hand is used to block, grapple or offer a ridge hand strike. The 18 inch hook and loop wrist strap has a tri-sect closure that provides extra support as well as further protection to the wrist. This Velcro comes in generous amounts which ensure a lot of flexibility since the same can be adjusted to a perfect fit. The thickness of the strap is an added form of protection to the user’s wrist. The foam that is provided between the wrist strap and the striking surface gives more protection to the wrist and the hand. 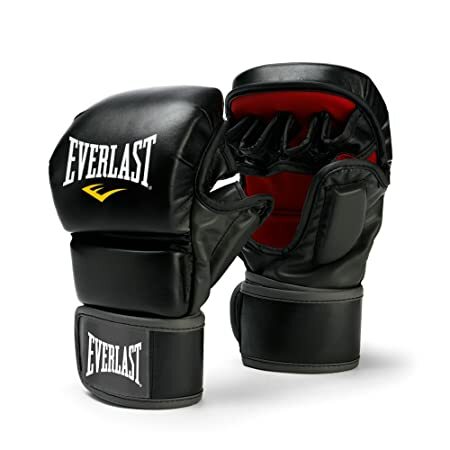 This Everlast pair of gloves offers a perfect fit yet very comfortable due to the anatomical shape that it features. This puts the user’s hands into the natural fist position any time they are worn. The glove has an antimicrobial liner that serves to keep the users hands dry and free from bad odor caused by sweat. This added feature of the ever-fresh antimicrobial liner ensures the wearer remains comfortable during the session and keeps away any itching after its use. The weight of the glove also does offer adequate punch power to the user. The fact that the glove allows a clench is an added advantage since one can pick up stuff especially if they wish to rehydrate without having to remove the glove. For this reason, the glove doesn’t make the hand feel very restricted since it allows adequate hand movement which is a comfortable idea to any boxer. 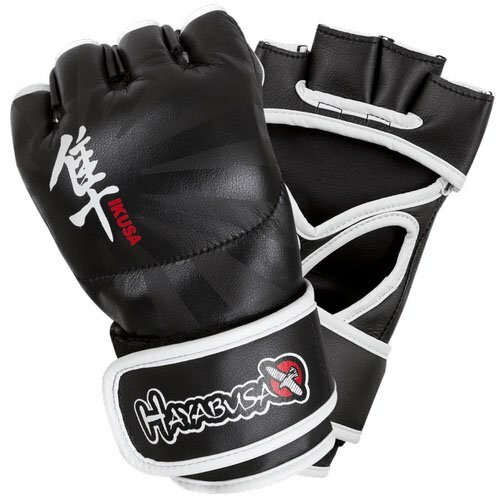 The Hayasuba Ikusa MMA gloves are of a sleek and practical design that is meant to give a superior fit to its wearer together with excellent wrist support. The Hayasuba gloves are made from scientific research background to offer comfort, protection and functionality all in one. The glove is made of thick Vylar leather which provides durability and long lasting experience due to the innovatively engineered design. The vylar leather used is resistance to any surface abrasions, does not tear or form cracks as proven by the scientific testing from the Hayasuba Company. This glove is designed with a Dual-X closure system, the reason for the perfect fit and superior support to the wrist. The Hayasuba Glove comes with an ultra reactive inner core complex and moisture licking feature. The stitching of this Hayasuba Ikusa glove is excellently done to ensure it does not fall apart while in use thus enhancing its durability. The glove is designed specifically for heavy bag works and sparring. This well constructed glove is light in weight, resilient and does not appear as bulky as other brands of same size in the market. The ultra reactive inner core complex is designed to provide excellent ligament protection as well as hand alignment. This Deltra EG technology that is scientifically developed is light yet offers very effective protection from impact. The featured patented Dual-X wrist closure offers the wrist maximum support which enhances the striking power of the user. This feature utilizes a double Velcro closure which provides the added security to the wrist. The Dual-X wrist wrap together with the fusion splinting features are made to aid in injury prevention by ensuring the hand and the wrist align in a perfect position when striking. Apart from the protective feature they also help maximize power while preventing loss of energy. This glove uses a combination of foams in ensuring the wearer is protected from impact and the double safety strap promotes protection to the wrist further. This glove provides a perfect fit which ensures the hands feel comfortable inside the glove. The moisture licking technology used keeps the hands dry thus comfortable during the entire training session. This lining is made of ECTA carbonized bamboo which enhances the comfort of the glove. This advanced moisture wicking system ensures that the gloves do not slide due to sweat, regulates temperatures by preventing overheating and acts as a deodorizer that prevents excessive sweating. 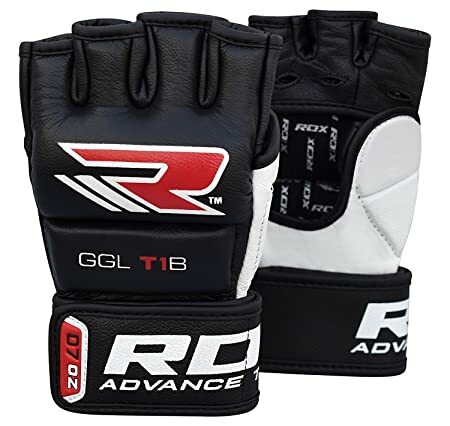 The RDX cow hide leather MMA grappling glove is made from cow leather as its title and with an integrated gel mound. The cow hide leather ensures the glove durability and offers a comfortable feel to it. This sleekly designed glove comes with a grip bar that lines the palm that makes them ideal for striking. The comprehensive padding though hinder any form of grabbing offers maximum protection. The glove is designed in an ergonomic shape and is made of a tough stitching that enhances durability further. The gloves are designed in four colors; red, black, grey and blue and four sizes, and is designed for cross training. The gloves have quality padding that extends to individual padding for each finger to offer maximum protection to the wearer. The IMT layered padding offers heavy duty shock absorption thus the excellent security offered to the user. The glove covers most of the hand area to offer security from any impact. The wrist strap though standard offers protection to the wrist and although the glove is 7 ounces, it feels more like a 16 ounce glove due to the comprehensive gel padding that enhances protection to the user. This extensive padding not only does it offer protection, but a strong fit to the user’s hands as well. The glove has a palm opening and finger loops that offer enough snugness while securing the hand. The adequate length afforded in the wrist wraps, ensures a good fit and protection to the wrist against any injuries from upward or downward movements of the same. The gel padding which is concentrated on the back of the hand, offers enough protection while blocking strikes. The thumb protection provided lessens the likelihood of any injuries to the same. The RDX glove has an ergonomic design which ensures a perfect and comfortable fit. It also has enough room within which is meant to incorporate submission and grappling moves of the wearer. The inside is made of a breathable mesh lining to ensure the hand remains dry and comfortable during the wear. Due to the cow hide leather used in its construction the glove feels comfortable and responds well. The RDX glove though with an ultra pro complex padding, does not compromise its weight and mobility to the user. The glove has enough room for hand wraps which enhances its comfort and safety. The glove is light thus comfortable to wear. The RDX gloves are made from cow hide leather which after break-in starts to feel like a second skin to the user thus very comfortable and snug fitting which makes the glove feel natural and well balanced. The leather strap also ensures that the glove achieves lightness and a cool environment to the hands. The flexibility of the wrist strap ensures it can be adjusted to a proper comfortable fit too. The hook and loop mechanism of the same does not only offer a secure fit but also ease in removing and putting on of the glove. Hopefully the detailed reviews above are useful for your search of the best MMA gloves. 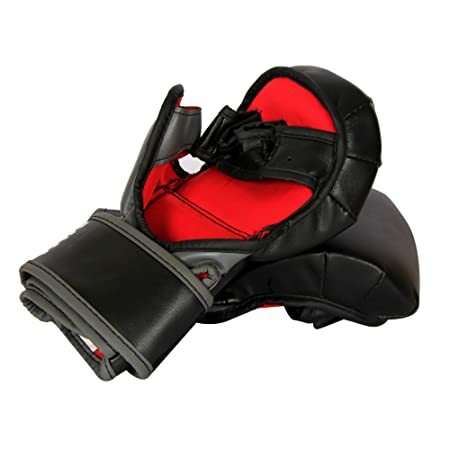 We also have written reviews of best kickboxing gloves. Check it out if you are also interested!